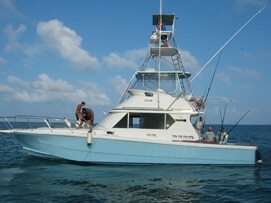 The Iona is a 43ft O’Brien complete with tuna tower and powered by twin 450hp Cummins motors. Launched in 1997 she was specifically designed and built for game fishing charters with manoeuvrability and stability capabilities a major factor in mind for all sea conditions. The layout has been designed to suit both client and crew with a spacious cockpit area for swinging room for anglers in the chair and ample room for crew to wire & tag their catch. Fully air-conditioned the interior is comfortable and practical for day and overnight charters. The accommodation consists of a side stateroom with doubled bed and ensuite with shower and toilet. The V berth comfortably accommodates 4 anglers with a separate shower and toilet. The large open saloon with leather lounges, entertainment system and the fully equipped galley with refrigeration and storage capacity to stay out for extended charters make the Iona a very comfortable option for live-aboard overnight charters. State of the Art Raymarine sounder and navigational equipment assists in maximising on fish finding capabilities. 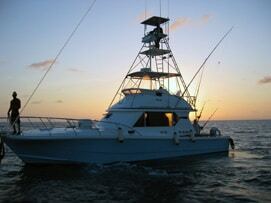 The Iona will deliver a live-aboard experience with comfort and practicability and world class fishing action. 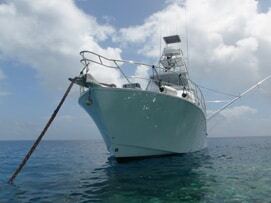 Queensland & NSW surveyed for 6 passengers plus 2 crew and comfortably sleeps 5 for overnight live on board charters. Cairns Giant Black Marlin Season from September to December – day charters, overnight live-aboard charters and mothership packages. Port Stephens & Newcastle from December to May – day charters targeting black, blue and striped marlin. Gold Coast from April to August – targeting black, blue & striped marlin & other game fish for day charters. Private luxury charters for corporate events, parties or family events.